A unique lymphoid lineage, Vα14 NKT cells, bearing an invariant Ag receptor encoded by Vα14 and Jα281 gene segments, play crucial roles in various immune responses, including protective immunity against malignant tumors. A specific ligand of Vα14 NKT cells is determined to be α-galactosylceramide (α-GalCer) which is presented by the CD1d molecule. Here, we report that dendritic cells (DCs) pulsed with α-GalCer effectively induce potent antitumor cytotoxic activity by specific activation of Vα14 NKT cells, resulting in the inhibition of tumor metastasis in vivo. Moreover, a complete inhibition of B16 melanoma metastasis in the liver was observed when α-GalCer-pulsed DCs were injected even 7 days after transfer of tumor cells to syngeneic mice where small but multiple metastatic nodules were already formed. The potential utility of DCs pulsed with α-GalCer for tumor immunotherapy is discussed. The Vα14 NKT cell has been recently defined as a novel lymphocyte lineage, characterized by the expression of an invariant Ag receptor encoded by Vα14 and Jα281 gene segments (1, 2, 3), and detected in most of the peripheral tissues, including lung, liver, bone marrow, and placenta (4). A glycolipid Ag, α-galactosylceramide (α-GalCer),3 has been found to be a ligand for Vα14 NKT cells and specifically presented by a class Ib molecule, CD1d (5, 6, 7), which is well conserved through mammalian evolution and lacks allelic polymorphism (8, 9). Injection of α-GalCer inhibits tumor metastasis almost completely in the liver or lung (10), indicating that Vα14 NKT cells are activated in vivo by the ligand and that the activated Vα14 NKT cells serve as a critical component of host immunity to tumors. MHC peptides recognized by tumor-specific CTL are being defined in various mouse and human tumor cells, some of which indeed induce CTLs in vitro and also inhibit tumor growth in vivo (11, 12, 13). These results suggest that tumor-specific peptides are particularly effective for the induction of immune reactions against tumors. It is well established that CTL induction usually follows peptide presentation by MHC class I molecules on APC, and, therefore, APCs pulsed with peptides in vitro can stimulate Ag-specific CTLs when administered in vivo. In fact, dendritic cells (DCs) pulsed with a soluble Ag are able to induce protective antitumor immunity accompanied by tumor-specific CTL induction (14, 15, 16, 17). Since α-GalCer specifically activates Vα14 NKT cells in vitro and in vivo, we address whether DCs pulsed with α-GalCer are able to activate Vα14 NKT cells in vivo and induce protective antitumor immunity in situ. Vα14 NKT mice (RAG-1−/− Vα14 transgenic (tg) Vβ8.2tg mice) with a C57BL/6 (B6) background were established by mating with RAG-1−/− Vβ8.2tg and RAG-1−/− Vα14tg mice as described (5). In Vα14 NKT mice, only transgenic TCRαβ (Vα14tg and Vβ8.2tg) was expressed and thus resulted in preferential development of Vα14 NKT cells with undetectable T cells, NK cells, and B cells (5). RAG-1−/− mice were kindly provided by Dr. Susumu Tonegawa, MIT, Boston, MA (18). Pathogen-free B6 mice were purchased from Japan SLC (Shizuoka, Japan). All mice used in this study were 8–10 wk old and were maintained in our animal facility under specific pathogen-free conditions. α-Galactosylceramide ((2S,3S,4R)-1-O-(α-d-galactopyranosyl)-N-hexacosanoyl-2-amino-1,3,4-octadecanetriol; α-GalCer) was provided by Kirin Brewery (Gunma, Japan) and prepared as previously described (5, 10). DCs were prepared from spleen of B6 mice according to the methods of Crowly et al. (5, 19). Briefly, spleens were treated with collagenase type III (400 U/ml; Worthington Biochemical, Freehold, NJ) for 20 min at 37°C in 5% CO2 and then disrupted on a metal screen. Resulting single cells were loaded on a dense BSA (Pentex Path-O-Cyte 4; Bayer, IL) and centrifuged at 1500 × g for 30 min at 4°C. The low density fraction was further applied to plastic culture dishes (Falcon, Franklin Lakes, NJ) for 90 min at 37°C in 5% CO2. Adherent cells were pulsed with α-GalCer (100 ng/ml in 0.025% polysolvate 20) or control vehicle (0.025% polysolvate 20) overnight at 37°C. After washing extensively, nonadherent cells were used as α-GalCer-pulsed DCs. The 51Cr release assay was conducted by a standard method as described (10). In brief, α-GalCer-pulsed DCs were injected i.v. into normal B6 or Vα14 NKT mice, and, 24 h later, the cytotoxic activity of their spleen cells was assessed on YAC-1 cells, B16 melanoma cells, or Colon 26 cells labeled with 100 μCi of sodium chromate (51Cr; Amersham Pharmacia Biotech, Uppsala, Sweden) for 1 h at 37°C. Effector cells (3 × 105) were mixed with 1 × 104 tumor cells at indicated E:T ratios in a 96-well round-bottom plate (Falcon, Lincoln Park, NJ) in 150 μl of complete media at 37°C in 5% CO2. Four hours later, released 51Cr was measured. The percentage cytotoxicity was calculated, and mean values were shown with SDs as described (10). B16 melanoma cells (3 × 106) or Lewis lung carcinoma (LLC) cells (4 × 105) were inoculated into B6 mice on day 0 via spleen for liver metastasis or via tail vein for lung metastasis, respectively. In the case of liver metastasis model, mice were sacrificed on day 14, and the metastasis of B16 melanoma cells in the liver was evaluated by measuring the amount of melanoma Ag (GM3 ganglioside) as described (20). For the lung metastasis model, mice were sacrificed on day 18, and the number of metastatic nodules of LLC was counted under a light microscope. Three to five mice were used for each group in every experiment. α-GalCer-pulsed DCs were transferred i.v. We have reported that murine and human NKT cells recognize α-GalCer in a CD1d-restricted fashion (5, 6, 21, 22, 23). Moreover, the administration of α-GalCer activates Vα14 NKT cells in vivo and induces cytotoxic activity against various tumor cells in an NK-like fashion (5, 10). Thus, we expected efficient activation of resting Vα14 NKT cells with α-GalCer-pulsed DCs in vivo. To test this assumption, graded numbers of α-GalCer-pulsed DCs were i.v. administered into normal B6 mice, and their cytotoxic activity in the spleen cells was evaluated by 51Cr release assay (Fig. 1⇓A). A significant cytotoxicity against YAC-1 cells was induced by more than 2 × 105 cells of α-GalCer-, but not vehicle-, pulsed DCs. This suggests that α-GalCer-pulsed DCs indeed activate Vα14 NKT cells in vivo. To confirm the data in Fig. 1⇓A, Vα14 NKT mice bearing only Vα14 NKT cells were i.v. administered 1 × 106 α-GalCer-pulsed DCs. A potent antitumor cytotoxicity against B16 melanoma and Colon 26 cells was detected only when α-GalCer-, but not vehicle-, pulsed DCs were injected (Fig. 1⇓B). Activation of Vα14 NKT cells in vivo by administration of α-GalCer-pulsed DCs. A, B6 mice were i.v. administered 1 × 106 vehicle-pulsed DCs (○), 2 × 105 α-GalCer-pulsed DCs (▴), or 1 × 106 α-GalCer-pulsed DCs (•) of B6 mice. Twenty four hours after the administration, their cytotoxicity was examined on YAC-1 cells at indicated E:T ratios. B, α-GalCer-pulsed (•) or vehicle-pulsed (○) DCs (3 × 105) from RAG-1−/− mice were transferred i.v. into Vα14 NKT mice. Their cytotoxicity was assayed 24 h after DC transfer on B16 melanoma and Colon 26 cells. To test whether the transfer of α-GalCer-pulsed DCs induces inhibition of tumor metastasis as a consequence of in vivo activation of Vα14 NKT cells, α-GalCer- or vehicle-pulsed DCs were i.v. transferred into normal B6 mice on the next day (day 1) after intrasplenic injection of tumor cells on day 0 (day 0). 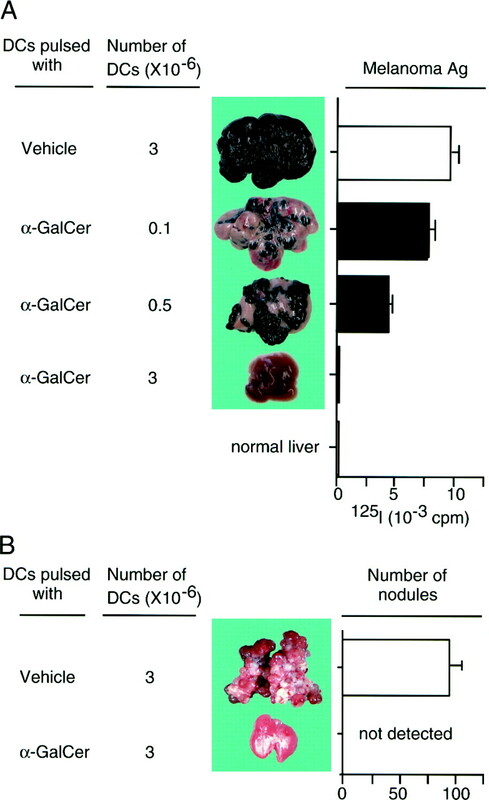 Hepatic metastasis of B16 melanoma cells was inhibited by transfer of α-GalCer-pulsed DCs in a dose-dependent manner (Fig. 2⇓A). No metastatic nodules were detected in the liver with injection of α-GalCer-, but not vehicle-, pulsed DCs (3 × 106 cells) macroscopically (Fig. 2⇓A) and microscopically (data not shown). No significant melanoma Ag was detected by quantitation of B16 melanoma Ag, GM3 ganglioside, when 3 × 106 α-GalCer-pulsed DCs were transferred (Fig. 2⇓A, right). The inhibitory effect of tumor metastasis was also observed in a lung metastatic model using LLC cells. A single i.v. injection of α-GalCer-pulsed DCs (3 × 106), but not vehicle-pulsed DCs, induced a complete inhibition of lung metastasis of LLC (Fig. 2⇓B). Inhibition of tumor metastasis by α-GalCer-pulsed DCs. The antitumor effect of α-GalCer-pulsed DCs was evaluated using two different metastasis models: liver metastasis of B16 melanoma (A) and lung metastasis of LLC (B). Tumor cells were inoculated into B6 mice on day 0. One day after the inoculation, indicated numbers of α-GalCer-pulsed DCs were transferred i.v. Representative photographic views of metastasized organs are shown. The quantitative analysis of tumor metastasis was performed by measuring the amount of melanoma Ag, GM3 ganglioside in the liver (A, right), or the number of metastatic nodules in the lung (B, right). The levels were indicated as filled or open bars in α-GalCer-pulsed DCs or control vehicle-DCs, respectively. Five mice were used in each group, and mean values with SDs are shown. The next experiments were designed to know whether the α-GalCer-pulsed DCs were also effective on established tumors. To address this question, α-GalCer-pulsed DCs were i.v. transferred into B6 mice bearing multiple metastatic tumor foci in the liver. First, the levels of metastasis of B16 melanoma cells in the liver were monitored, and representative results on days 5, 7, and 9 are shown in Fig. 3⇓A. On day 5, no metastatic foci were observed macroscopically, whereas numerous single melanoma cells were microscopically identified in a section of the liver (arrowheads). On day 7, however, numerous metastatic foci were detected both macroscopically and microscopically. Their sizes were increased, and some were fused with each other on day 9. The sizes of tumor foci on day 7 were in the range between 0.1 and 0.5 mm in diameter, and about 100 foci were detected macroscopically (Fig. 3⇓B). Consequently, we started to transfer 3 × 106 vehicle- or α-GalCer-pulsed DCs on day 7, on day 9, and on day 11 and continued every other day until day 13. We chose the dose of DCs (3 × 106) that showed significant curative effects, as shown in Fig. 2⇑. As we anticipated, almost complete eradication of established metastatic foci was observed when the transfer of α-GalCer-pulsed DCs (3 × 106) started on day 7 (Fig. 3⇓C). Little effect was observed whether the transfer started on day 9 or day 11. These results strongly indicated that α-GalCer-pulsed DCs exerted a strong antitumor effect, resulting in the regression of the established metastatic nodules. Finally, to evaluate the efficacy of α-GalCer-pulsed DCs, we treated the melanoma-bearing B6 mice with simple injection of α-GalCer (100 μg/kg) started on day 1, 3, 5, and 7 (Fig. 3⇓D). In contrast to the treatment with α-GalCer-pulsed DCs, significant antitumor effect was observed only when the α-GalCer injection started on day 1 and on day 3, suggesting a significant advantage for the use of α-GalCer-pulsed DCs in the eradication of the established tumor metastasis. Regression of established metastatic tumors by α-GalCer-pulsed DCs. The macroscopic and microscopic views of tumor foci (A) and their sizes and numbers on day 7 and day 9 are shown (B). Arrows in A indicate micrometastasis of B16 melanoma cells. C, Effects of i.v. administration of α-GalCer-pulsed DCs on established B16 melanoma foci were assessed. B6 DCs (3 × 106) were pulsed with vehicle (open bar) or α-GalCer (filled bar) and then i.v. transferred into tumor-bearing B6 mice. The transfer of pulsed DCs started on day 7, day 9, or day 11. The same numbers of pulsed DCs were injected every other day until day 13. All mice were sacrificed on day 14. Representative photographic views are shown. Three mice are used in each group, and mean values with SDs are shown. The results of two independent experiments were similar. D, Tumor-bearing B6 mice were treated with i.v. injection of vehicle (open bar) or α-GalCer (100 μg/kg; filled bar) in vivo, which started on days 1, 3, 5, and 7 and continued every other day until day 13. The amounts of melanoma Ag were measured and are depicted as bars. We have recently reported that the injection of α-GalCer (10) or IL-12 (20) prevents liver or lung metastasis of tumors via activation of Vα14 NKT cells in vivo in situ. The antitumor effect is also observed in various malignant tumor cells, including LLC (20), erythroleukemia (Friend virus-induced lymphoma cell, FBL-3), Colon 26, or a TAP-2-deficient mutant of Rauscher virus-induced lymphoma (RMA-S) (10). Although the antitumor effects are dramatic, it is not clear whether the effects are also observed on the established tumor nodules. In this paper, we extended our investigation by using α-GalCer-pulsed DCs and trying to treat established metastatic tumor foci. Seven days after intrasplenic inoculation of B16 melanoma cells, the number of metastasized nodules in the liver were more than 100, and their sizes were in the range between 0.1 to 0.5 mm in diameter. These tumor nodules were almost completely eradicated when the mice were treated with 3 × 106 α-GalCer-pulsed DCs on days 7, 9, 11, and 13 (Fig. 3⇑C). Since it takes 24 h to activate Vα14 NKT cells by the administration of α-GalCer-pulsed DCs (Fig. 1⇑ and 10), even slightly bigger tumor nodules than those observed on day 7 are thought to be regressed. We did not observe significant antitumor effect when the treatment started on day 9, probably because the numbers (3 × 106) of DCs injected were not enough to eliminate established tumor cells with exponential proliferation or bigger tumor sizes. In any event, these results encourage the view of clinical applications, particularly those that focus on the treatment of micrometastasis after radical operations. α-GalCer is presented by a monomorphic CD1d on DCs and recognized by the invariant Vα14 NKTCR (5, 6). Injection of α-GalCer in vivo, only when started soon after tumor cell transfer, induces antitumor activity against metastatic tumors macroscopically (5) and microscopically (24). This indicates that it takes a longer time for DCs to present α-GalCer, to activate Vα14 NKT cells, and to induce antitumor activities in vivo. However, α-GalCer-pulsed DCs are more effective than the direct injection of α-GalCer, as evidenced by the results showing that established metastatic foci can be regressed by α-GalCer-pulsed DCs but not by α-GalCer injection (Fig. 3⇑, C and D). The manipulation of tumor immunity is totally dependent on the induction of tumor-specific cytotoxicity, which is known to be mediated by CTL (14, 15, 16). Thus, many efforts have been made to identify tumor-specific peptides, including human malignant melanoma-related Ags, such as gp100 (25), melanoma antigen recognized by T cells-1 (MART-1 (11)), tyrosinase (11), and melanoma-associated antigen-1 (MAGE-1) and MAGE-3 (26). Indeed, some of these peptides have shown a successful induction of antimelanoma immunity (12). Furthermore, various tumor-associated Ags or specific peptides, such as PSA (27), papilloma virus protein (28), receptor for advanced glycosylation and products-1 (RAGE-1 (29)), and tumor associated mucin 1 (MUC1) (30, 31), are identified, and their ability to generate CTL is elucidated. However, there are several critical problems for the application of tumor peptide therapy to cancer patients. For example, since MHC haplotypes in individuals are different, tumor peptides derived from a certain MHC molecule cannot be applied to other patients with different MHC. Moreover, the MHC level is reported to be different in the region of tumor tissues (32, 33), and, thus, all tumor cells cannot be targets of CTL. In this view, the CD1d/α-GalCer and NKT cell system appears to be ideal to circumvent these problems, because Vα14 NKT cells effectively kill tumors with low or no expression of MHC. The second important point is that α-GalCer-pulsed DCs can induce antitumor activity in vivo within 24 h after cell transfer (Fig. 1⇑B). Our previous study using RNase protection analysis shows that Vα14 NKT cells are expanded in the peripheral tissues in situ (34), suggesting no requirement of clonal expansion of Vα14 NKT cells to exert antitumor functions. Thus, only specific activation of resting Vα14 NKT cells is required. This is distinct from the peptide-mediated antitumor immunity, in which the in vivo induction and expansion of tumor peptide-specific CTLs are indispensable, because it requires a certain period of time and also needs booster immunization to expand specific CTL clones in vivo to obtain sufficient antitumor effects. In summary, the unique antitumor immune system comprised with CD1d and Vα14 NKT cells in mice is specifically driven by a single glycolipid Ag, α-GalCer. Since α-GalCer works as a ligand for Vα24 NKT cells in the human NKT system (21, 22, 23), our findings suggest the potential utility of the CD1d/NKT system for cancer immunotherapy and might open a new window for inclusive cancer therapy in humans. We thank Kirin Brewery Co. Ltd. for providing us with glycolipid reagents, and Ms Hiroko Tanabe for secretarial work. ↵1 This work was supported in part by a Grant-in-Aid for Scientific Research on Priority Areas (06282103) from the Ministry of Education, Culture, Sports, and Science, Japan, and by a grant from Taisho Pharmaceutical Company, Japan. ↵3 Abbreviations used in this paper: α-GalCer, α-galactosylceramide; DC, dendritic cell; LLC, Lewis lung cancer; tg, transgenic; B6, C57BL/6.